Syria has been ravaged by conflict since the outbreak of anti-government protests in March 2011. President Bashar al-Assad’s regime brutally suppressed the protests but by 2012, the unrest had escalated into a full-blown civil war. The Syrian Civil War has been described by the United Nations as “the biggest humanitarian emergency of our era.”  It has destabilized the region as territorial control of Syria has fragmented, fighting has spilled over into neighboring countries, and numerous foreign powers have intervened on different sides of the conflict. The crisis has been exacerbated by large-scale chemical weapons use, most notably the gruesome chemical weapons attack by regime forces in Ghouta, near Damascus, on 21 August 2013. The attack precipitated Syria’s entry into the Chemical Weapons Convention as well as an international effort to remove all chemical weapons from the country. Despite these efforts, chemical weapons attacks continue, including the use of what OPCW investigators determined to be sarin in Khan Sheikhoun in April 2017, and the suspected use of chlorine and an unidentified nerve agent in Douma on 7 April 2018. The Syrian government has denied responsibility for these attacks. The United States carried out airstrikes on Syrian targets in response to Khan Sheikhoun and Douma. On 6 April 2017, the U.S. launched 59 Tomahawk missiles at Al-Shayrat airbase after determining it was the location from which the chemical attack on Khan Sheikhoun was launched. After the Douma attack, the United States, the United Kingdom, and France conducted airstrikes against three sites deemed crucial to the Syrian chemical weapons program. The regime of President Bashar al-Assad, with significant military support from Russia, Iran, and Iran-backed terrorist groups such as Hezbollah. The Islamic State (IS), a radical Sunni Islamist terrorist group with its capital in the eastern Syrian city of Raqqa. IS invaded Iraq in 2014 and routed the Iraqi army, adding significant Iraqi territory to its Syrian holdings. IS declared the establishment of a caliphate in June 2014, and has directed and inspired terrorist attacks throughout the world. Syrian opposition forces, including remnants of the Free Syrian Army, a loose association of anti-regime groups with various ideologies and aims. Several opposition forces have received material support from the United States and other Western countries and regional patrons. In August 2016, Turkish military forces crossed the border into Syria and have provided direct military support to opposition groups. The Syrian Democratic Forces, an anti-Assad, anti-IS alliance of militias dominated by the Kurds, an ethnic minority prevalent in northern Syria. The Kurds have received support from the United States and other Western nations, which is controversial for Turkey-NATO relations given the fact that some of the Kurdish factions are considered to be terrorist organizations in Turkey, where Kurdish separatist terrorism is a decades-long problem. Syria is a non-nuclear weapon state party to the Treaty on the Non-Proliferation of Nuclear Weapons (NPT) and has a Comprehensive Nuclear Safeguards Agreement with the International Atomic Energy Agency (IAEA). For more details, visit the Syria Nuclear page. For more details, visit the Syria Biological page. For more details, visit the Syria Chemical page. For more details, visit the Syria Missile page. “Syria in Civil War, Red Cross Says,” BBC News, 12 July 2012, www.bbc.com. Adrian Edwards, “Needs Soar as Number of Syrian Refugees Tops 3 Million,” UNHCR, 26 August 2014, www.unhcr.org. International Atomic Energy Agency, "Report by the Director General: Implementation of the NPT Safeguards Agreement in the Syrian Arab Republic," 24 May 2011, www.isis-online.org; Anthony H. Cordesman, "The Israeli Nuclear Reactor Strike and Syrian Weapons of Mass Destruction: A Background Analysis," Center for Strategic and International Studies, 24 October 2007, www.csis.org. "Syrian Nuclear Dispute Sent to United Nations," Global Security Newswire, 9 June 2011. “IAEA Director General Reviews Global Trends at Start of Board Meeting,” 6 March 2017, www.iaea.org. David Albright, Serena Kelleher-Vergantini, and Sarah Burkhard, "Syria's Unresolved Nuclear Issues Reemerge in Wake of ISIL Advance and Ongoing Civil War," Institute for Science and International Security, 30 June 2015, www.isis-online.org. “Decision: Combined plan for the destruction and verification of the ‘al-Maliha’ ricin production facility in the Syrian Arab Republic,” Executive Council, The Organisation for the Prohibition of Chemical Weapons, November 19, 2014, www.opcw.org. Shoham, Dany, “Chemical and Biological Weapons in Egypt,” Nonproliferation Review 5.3 (Spring-Summer 1998), www.nonproliferation.org. Magnus Normark, Anders Lindblad, Anders Norqvist, Björn Sandström, and Louise Waldenström, "Syria and WMD: Incentives and Capabilities," (Umeå: FOI - Swedish Defence Research Agency, 2004) p. 35. Council on Foreign Relations, “French Government’s Declassified Intelligence Assessment on Chemical Weapons Attack in Syria,” 2 September 2013, www.cfr.org. Michelle Nichols, “U.N./OPCW Inquiry Blames Syria Government for Gas Attacks, Likely Sanctions Fight Looms,” Reuters, 24 August 2016, www.reuters.com. United Nations General Assembly, United Nations Security Council, “United Nations Mission to Investigate Allegations of the Use of Chemical Weapons in the Syrian Arab Republic,” 13 December 2013, A/68/663-S/2013/735, www.un.org. White House, Office of the Press Secretary, “Government Assessment of the Syrian Government’s Use of Chemical Weapons on 21 August 2003,” 30 August 2013, https://obamawhitehouse.archives.gov. "Syria chemical attack: Key UN findings," BBC News, 17 September 2013, www.bbc.co.uk. Organization for the Prohibition of Chemical Weapons, “Member State-Syria,” www.opcw.org. "Press release by the Organisation for the Prohibition of Chemical Weapons and the United Nations on the advance team in Syria," Organization for the Prohibition of Chemical Weapons, 11 October 2013, www.opcw.org. "Syria Chemical Weapons Facilities 'Destroyed'," Al-Jazeera, 1 November 2013; Organisation for the Prohibition of Chemical Weapons, "Announcement to Media on Last Consignment of Chemicals Leaving Syria," OPCW News, 23 June 2014, www.opcw.org. David Alexander, "U.S. ship finishes neutralizing Syria's worst chemical arms: Pentagon," Reuters, August 18, 2014, www.reuters.com; Jim Garamone, "Cape Ray Begins Neutralizing Syrian Chemical Materials," DoD News (Washington), 7 July 2014, www.defense.gov. “200 Tons of Syrian Chemicals in UK for Destruction,” Associated Press, 16 July 2014, www.english.alarabiya.net. Anthony Deutsch, “Exclusive: Syria Begins Destruction of Chemical Weapons Facilities,” Reuters, 19 January 2015, www.reuters.com. Organisation for the Prohibition of Chemical Weapons, “Destruction of Chemical Weapons Completed,” 4 January 2016, www.opcw.org. Colum Lynch and David Kenner, “U.S. and Europe Say Assad May Have Kept Some Chemical Weapons,” Foreign Policy, 23 August 2016, www.foreignpolicy.com. Liz Sly, Suzan Haidamous, and Asma Ajroudi, “Nerve gas used in Syria attack, leaving victims ‘foaming at the mouth,’ evidence suggests,” The Washington Post, April 11, 2018, www.washingtonpost.com. ; “Letter dated 26 October 2017 from the Secretary-General addressed to the President of the Security Council,” Report from the OPCW-UN Joint Investigated Mechanism transmitted by the Secretary-General, United Nations, October 26, 2017, www.un.org. Liz Sly, Suzan Haidamous, and Asma Ajroudi, “Nerve gas used in Syria attack, leaving victims ‘foaming at the mouth,’ evidence suggests,” The Washington Post, April 11, 2018, www.washingtonpost.com. Jim Garamone, “U.S. Allies Strike Syrian Targets in Response to Regime’s Chemical Attacks,” DoD News, April 13, 2018, www.defense.gov. “Final report of the Panel of Experts submitted pursuant to resolution 2345 (2017),” Panel of Experts established pursuant to resolution 1874 (2009), United Nations, March 5, 2018, www.un.org. "R-17 (Scud B/C/D variants)," Jane's Strategic Weapon Systems, 30 April 2012, www.janes.com. 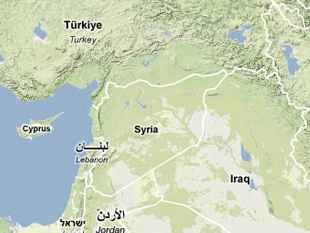 Missile Threat, "M-9 variant," The Claremont Institute, www.missilethreat.com; Jeffrey Lewis, "Iran Marketing Missiles?" Arms Control Wonk, 8 August 2011, www.armscontrolwonk.com; "Fateh A-110 variant (M-600)," Jane's Strategic Weapon Systems, 27 April 2012, www.janes.com. Anthony H. Cordesman, "Syrian Weapons of Mass Destruction: An Overview," Center for Strategic and International Studies, 2 June 2008, www.csis.org. Andre de Nesnera, “Syrian Scud Missiles Seen as Escalation of War,” Voice of America, 19 December 2012, www.voanews.com. “Israel Says 90 Pct of Syria’s Ballistic Missiles Used Up on Rebels,” Reuters, 18 November 2015, www.reuters.com. Karen DeYoung, “Russian Air Defense Raises Stakes of U.S. Confrontation in Syria,” The Washington Post, 17 October 2016, www.washingtonpost.com. Jeremy Binnie, “Iskander Missile Launcher Spotted in Syria,” Jane’s Defense Weekly, 31 March 2016, www.janes.com. CBS News, “U.S. Eyes Missiles Grabbed by ISIS in Syrian Town,” 15 December 2016, www.cbsnews.com. Acceded to Chemical Weapons Convention under pressure in 2013, following strong evidence the Assad regime had used chemical weapons against its own people during the ongoing civil war.